A nation’s destiny depends on its progeny. Therefore, it is important to train children to grow up to be morally sound and righteous citizens; patriotic and proud of their heritage. For the Sri Lankan parents living abroad, it is a daunting task and a challenge, to bring up their off spring according to the Dhamma and Sri Lankan traditions and values. Nevertheless it is the wish of all parents to see their children grow up in an environment that nurtures respect and belief in our religion, our values and our culture. In pursuit of this wish they seek the Buddhist Temple to provide the peaceful setting for the children to feel the loving kindness and serenity that pervades within the Temple atmosphere and facilitate the orientation of their minds to a Buddhist and a Sri Lankan way of life. 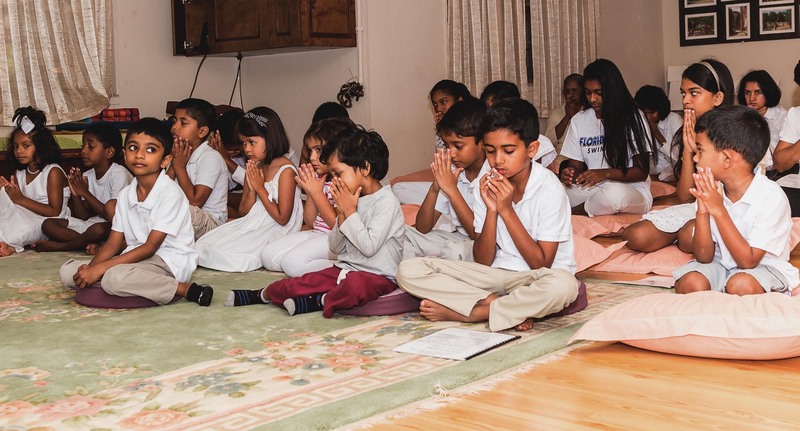 Attending the Dhamma school regularly is the first step in inducting the children to a Buddhist way of life. The responsibility of inculcating refined morals and our cultural values in our children must be borne by parents and religious institutions alike. 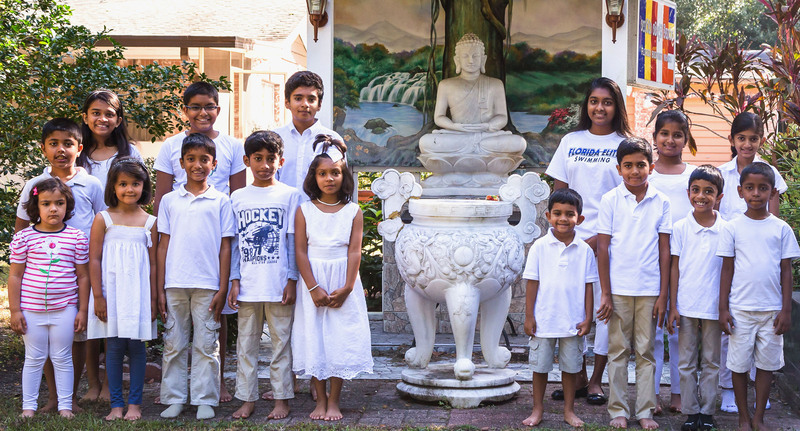 This obligation is indeed well endorsed and fulfilled by Florida Buddhist Vihara’s Sunday school program. The program addresses the following aspects of religious education and social training. Impart knowledge of the Dhamma in order to guide children to adopt the Buddhist way of life. Provide an understanding of the Buddha’s teaching applicable to a layman’s life using exemplary stories of the life of Buddha and other stories and adages extracted from Buddhist literature that help mold character. More in-depth understanding of the Dhamma is provided for the children in the higher age group. Provide practical training to instill our ethical and social values and to familiarize the children with Buddhist religious observations. Each session is structured to allow for the veneration of the triple gem, instructions by a Bhikku on noble behavior, short meditation time and the respecting of parents at the commencement. Sil (observing the 8 precepts) campaigns are conducted with the participation of children. Inculcate Sri Lankan cultural values by conducting cultural celebrations with the children spearheading these events. Sinhala and Tamil New year as well as Vesak celebrations are conducted to simulate the observation of these events in Sri Lanka. Instill virtuous qualities such as nonviolence, mutual cooperation, kindness and gratitude, environmental conservation, respect of elders and will to attend to the ailing, patriotism, societal obligations to children. Encourage reflections on their own lives to realize the importance of nurturing of scholastic as well as livelihood skills. Field trips and Dhamma talks by invited speakers and audio visual equipment complement the religious and social training provided. Currently about 20 children attend the Dhamma school regularly on the first and third Sundays of the month from 9.30 till 11.30 am. The academic year is from September to May when yearly exams are conducted. The level of the above stated curriculum depends on the age group and at present there are 4 age groups. Medium of instructions is English and no fee is levied. Buddhist children of all nationalities are welcome.